Can We Afford to Cure Cancer? - Plunkett Research, Ltd.
Home > News > Can We Afford to Cure Cancer? The U.S. National Institutes of Health (NIH) estimate that 1.7 million new cases of cancer will be diagnosed in America alone during 2018. While the overall cancer death rate fell by 25% from 1990 to 2014, according to the NIH, the cost of the treatments that are saving these lives is staggering, at nearly $150 billion yearly in America alone. Although traditional cancer treatments such as chemotherapies have improved in recent years, they continue to indiscriminately kill both healthy cells and cancerous cells, with significant long-term side effects for the patient. The revolutionary CAR-T treatment, in contrast, hits only the targeted cancerous cells. That is, CAR-T therapies are designed to recognize a specific cancerous tumor antigen, bind to this target and then activate, creating a tremendous immune system response to kill the cancer. Cancer remission rates of as high as 94% have been achieved in trials. Unfortunately, recently approved CAR-T drugs, such as Novartis’s Kymriah, approved in the U.S. in 2018, and Gliead/Kite Pharma’s Yescarta, approved in 2017, can cost more than $370,000 for the drugs alone, plus hundreds of thousands of additional dollars for the complete regimen of medical support and treatments required to complete the therapy—the total can easily top $1.5 million per patient. Drug developers claim that they need to charge such high prices to gain a reasonable return on their investment in research and development. Critics claim that the drug firms are simply charging the highest prices that they think the market will bear. CAR-T is so promising and so effective that hundreds of CAR-T based drugs are in various stages of clinical trials, including drugs targeting lung or breast cancers. Even if CAR-T costs were driven down to $1 million in total costs per treatment, they could double the total annual cost of cancer care, to $300 billion, if given to only 150,000 patients yearly (or 10% of new cancer patients). Meanwhile, insurers and government agencies are struggling to find ways to force down drug prices while reasonably maintaining patient access to the most promising treatments. The challenges are massive. For example, under current law, federal government administered Medicare is not allowed to negotiate drug prices, despite Medicare’s incredible size and cost to taxpayers. A bill recently proposed and sponsored by several members of Congress, the Medicare Drug Price Negotiation Act, is attempting to solve this situation. On the private coverage side, business giants Amazon, Berkshire Hathaway and JP Morgan Chase have established a “moon-shot” non-profit organization to attempt to use advanced technologies to improve health care results while driving down costs. The intent is to share this new entity’s findings freely in hopes of helping both the three founding firms and the nation as a whole. Plunkett Research recently published the 2019 edition of its Plunkett’s Biotechnology, Pharmaceuticals & Genetics Industry Almanac. This vital reference tool includes industry trends analysis, global industry statistics and profiles of hundreds of leading firms. It is available online to subscribers to Plunkett Research Online, as well as in printed almanac and ebook editions. 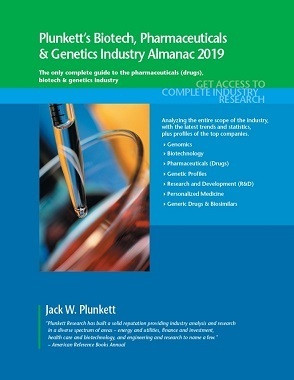 Plunkett’s Biotechnology, Pharmaceuticals & Genetics Industry Almanac, 2019 edition. This entry was posted in News on October 22, 2018 by NOTadmin.